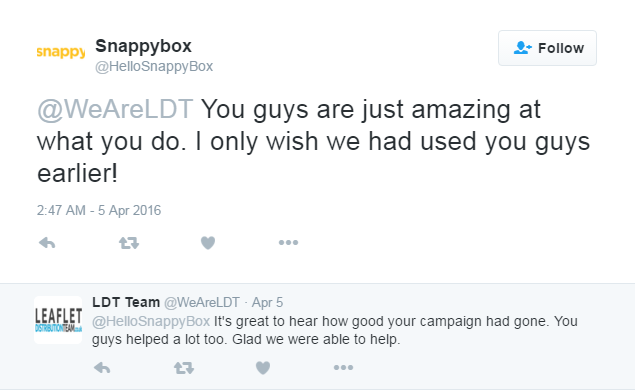 Snappybox.co.uk came to us after deciding to work with a leading marketing firm to boost sales and increase brand awareness. They were a new company offering a new concept that had no existing customer base and hadn’t quite defined who their target audience were. We worked closely with them and took time to understand their needs and the nature of their business so we could come up with effective marketing solutions. The company’s goals were to effectively promote of the new concept (renting boxes for moving and offering self-storage with a unique twist), introduce their own unique services to people already using storage companies who could get a better deal elsewhere, increase brand awareness significantly and heighten sales. We looked at a range of techniques and solutions before building a bespoke marketing campaign for the team. We came up with a range of solutions designed to help Snappybox.co.uk achieve their targets. These included designing and printing a range of marketing materials, conceptualisation, defining their target audience and areas and choosing suitable marketing channels. The campaign including direct door-to-door marketing, hand-to-hand marketing, business-to-business market and utilising walking billboards to create further exposure in public areas. Each solution played a vital role in the overall campaign. The solutions we identified brought outstanding results. These results included a significant jump in social media following, a huge boost in website traffic, a large increase in e-mail enquiries, 12 new clients within the first week of the campaign and 37 new clients in total. The work of the Leaflet Distribution Team came to represent at ROI of 368% after just two months. We are here for you if you require the services of a top marketing firm. Having achieved exceptional results for clients from a wide range of industries, we can be counted on to deliver the quality that you deserve. We know that no two clients’ needs are ever exactly the same, which is why we work hard to get to know you and your business before identifying and implementing solutions that suit you down to the ground. You can get in touch with us at any point if you require updates on how your campaign is progressing. Whether you’re on a limited budget or have more to spend, you can count on us to deliver the quality that you require, so get in touch today to find out more.